I woke up in the hospital room with a terrific headache—as if the whole world was revolving inside my brain. I remember, vaguely, the fall from my horse—Blackie. As I lay there, pictures began to form in my mind—pictures that stood still. I seemed to be in another world. Whether it was the future, or it was some ancient land, I could not say. Then slowly, like the silver screen of the “talkies,” but with color and smell and sound, I seemed to find myself in Los Angeles—but I swear it was much bigger, and buses and odd-shaped cars crowded the city streets. I thought about Hollywood Boulevard, and I found myself there. Whether this is true, I do not know, but there were a lot of guys my age with beards and wearing, some of them, earrings. All the girls, some of them keen-o, wore real short skirts. . . and they slouched along—moving like a dance. Yet they seemed familiar. I wondered if I could talk to them, and I said, “Hello,” but they didn’t see or hear me. I decided I would look as funny to them as they looked to me. I guess it is something you have to learn. I couldn’t do it. I noticed there was a quietness about the air, a kind of stillness. Something else was missing, something that should be there. At first, I couldn’t figure it out, I didn’t know what it was—then I did. There were no birds. I listened. I walked two blocks north of the Boulevard—all houses—no birds. I wondered what had happened to them. Had they gone away? Again, I could hear the stillness. Then I knew something was going to happen. I wondered what year it was. It certainly was not 1937. I saw a newspaper on the corner with a picture of the President. It surely wasn’t Mr. Roosevelt. He was bigger, heavier, big ears. If it wasn’t 1937, I wondered what year it was. . . My eyes weren’t working right. Someone was coming—someone in 1937—it was that darned, fat nurse ready to take my temperature. I woke up. Crazy dream. The next day: Gosh, my headache is worse. It is a wonder I didn’t get killed on that horse. I’ve had another crazy dream, back in Hollywood. Those people. Why do they dress like that, I wonder? Funny glow about them. It is a shine around their heads—something shining. I remember it now. I found myself back on the Boulevard. I was waiting for something to happen and I was going to be there. I looked up at the clock down by that big theater. It was ten minutes to four. Something big was going to happen. I wondered if I went into a movie (since nobody could see me) if I’d like it. Some cardboard blond was draped over the marquee with her leg six feet long. I started to go in, but it wasn’t inside. I was waiting for something to happen outside. I walked down the street. In the concrete they have names of stars. I just recognized a few of them. The other names I had never heard. I was getting bored, I wanted to get back to the hospital in Fresno, and I wanted to stay there on the Boulevard, even if nobody could see me. Those crazy kids. Why are they dressed like that? Maybe it is some big Halloween doings, but it don’t seem like Halloween. More like early spring. There was that sound again, that lack of sound. Stillness, stillness, stillness. The quiet is getting bigger and bigger. I know it is going to happen. Something is going to happen. It is happening now! It sure did. She woke me up, grinning and smiling, that fat one again. “It’s time for your milk, kiddo,” she says. Gosh, old women of thirty acting like the cat’s pajamas. Next time maybe she’ll bring hot chocolate. Where have I been? Where haven’t I been? I’ve been to the ends of the earth and back. I’ve been to the end of the world—there isn’t anything left. Not even Fresno, even though I’m lying here right this minute. If only my eyes would get a little clearer so I can write all this down. Nobody will believe me, anyway. I’m going back to that last moment on the Boulevard. Some sweet kid went past, dragging little boys (twins, I guess) by each hand. Her skirt was up—well, pretty high—and she had a tired look. I thought for a minute I could ask her about the birds, what had happened to them, and then I remembered she hadn’t seen me. Her hair was all frowzy, way out all over her head. A lot of them looked like that, but she looked so tired and like she was sorry about something. I guess she was sorry before it happened—because it surely did happen. There was a funny smell. I don’t know where it came from. I didn’t like it. A smell like sulphur, sulfuric acid, a smell like death. For a minute I thought I was back in chem. [Chemistry class]. When I looked around for the girl, she was gone. I wanted to find her for some reason. It was as if I knew something was going to happen and I could stay with her, help her. She was gone, and I walked half a block, then I saw the clock again. My eyes seemed glued to that clock. I couldn’t move. I just waited. It was five minutes to four on a sunny afternoon. I thought I would stand there looking at that clock forever waiting for something to come. Then, when it came, it was nothing. It was just nothing. It wasn’t nearly as hard as the earthquake we had two years ago. The ground shook, just an instant. People looked at each other, surprised. Then they laughed. I laughed, too. So this was what I had been waiting for. This funny little shake. It meant nothing. I was relieved and I was disappointed. What had I been waiting for? I started back up the Boulevard, moving my legs like those kids. How do they do it? I never found out. I felt as if the ground wasn’t solid under me, knew I was dreaming, and yet I wasn’t dreaming. There was that smell again, coming up from the ocean. I was getting to the 5 and 10 store and I saw the look on the kids’ faces. Two of them were right in front of me, coming my way. “Let’s get out of this place. Let’s go back East.” He seemed scared. It wasn’t as if the sidewalks were trembling—but you couldn’t seem to see them. Not with your eyes you couldn’t. An old lady had a dog, a little white dog, and she stopped and looked scared, and grabbed him in her arms and said: “Let’s go home, Frou, Frou. Mama is going to take you home.” That poor lady, hanging on to her dog. I got scared. Real scared. I remembered the girl. She was way down the block, probably. I ran and ran, and the ground kept trembling. I couldn’t see it. I couldn’t see it. But I knew it was trembling. Everybody looked scared. They looked terrible. One young lady just sat down on the sidewalk all doubled up. She kept saying, “earthquake, its the earthquake,” over and over. But I couldn’t see that anything was different. Then, when it came, how it came. Like nothing in God’s world. Like nothing. It was like the scream of a siren, long and low, or the scream of a woman I heard having a baby when I was a kid. It was awful. It was as if something—some monster—was pushing up the sidewalks. You felt it long before you saw it, as if the sidewalks wouldn’t hold you anymore. I looked out at the cars. They were honking, but not scared. They just kept moving. They didn’t seem to know yet that anything was happening. Then, that white car, that baby half-sized one came sprawling from the inside lane right against the curb. The girl who was driving just sat there. She sat there with her eyes staring, as if she couldn’t move, but I could hear her. She made funny noises. I watched her, thinking of the other girl. I said that it was a dream and I would wake up. But I didn’t wake up. The shaking had started again, but this time different. It was a nice shaking, like a cradle being rocked for a minute, and then I saw the middle of the Boulevard seem to be breaking in two. The concrete looked as if it were being pushed straight up by some giant shovel. It was breaking in two. That is why the girl’s car went out of control. And then a loud sound again, like I’ve never heard before—then hundreds of sounds—all kinds of sounds; children, and women, and those crazy guys with earrings. They were all moving, some of them above the sidewalk. I can’t describe it. They were lifted up. And the waters kept oozing—oozing. The cries. God, it was awful. I woke up. I never want to have that dream again. It came again. Like the first time which was a preview and all I could remember was that it was the end of the world. I was right back there—all that crying. Right in the middle of it. My eardrums felt as if they were going to burst. Noise everywhere. People falling down, some of them hurt badly. Pieces of buildings, chips, flying in the air. One hit me hard on the side of the face, but I didn’t seem to feel it. I wanted to wake up, to get away from this place. It had been fun in the beginning, the first dream, when I kind of knew I was going to dream the end of the world or something. This was terrible. There were older people in cars. Most of the kids were on the street. But those old guys were yelling bloody murder, as if anybody could help them. Nobody could help anybody. It was then I felt myself lifted up. Maybe I had died. I don’t know. But I was over the city. It was tilting toward the ocean—like a picnic table. The buildings were holding, better than you could believe. They were holding. They were holding. They were holding. The people saw they were holding and they tried to cling to them or get inside. It was fantastic. Like a building had a will of its own. Everything else breaking around them, and they were holding, holding. I was up over them—looking down. I started to root for them. “Hold that line,” I said. “Hold that line. Hold that line. Hold that line.” I wanted to cheer, to shout, to scream. If the buildings held, those buildings on the Boulevard, maybe the girl—the girl with the two kids—maybe she could get inside. It looked that way for a long time, maybe three minutes, and three minutes was like forever. You knew they were going to hold, even if the waters kept coming up. Only they didn’t. I’ve never imagined what it would be like for a building to die. A building dies just like a person. It gives way, some of the bigger ones did just that. They began to crumble, like an old man with palsy, who couldn’t take it anymore. They crumbled right down to nothing. And the little ones screamed like mad—over and above the roar of the people. They were mad about dying. But buildings die. I couldn’t look anymore at the people. I kept wanting to get higher. Then I seemed to be out of it all, but I could see. I seemed to be up on Big Bear near San Bernardino, but the funny thing was that I could see everywhere. I knew what was happening. The earth seemed to start to tremble again. I could feel it even though I was high up. This time it lasted maybe twelve seconds, and it was gentle. You couldn’t believe anything so gentle could cause so much damage. But then I saw the streets of Los Angeles—and everything between the San Bernardino mountains and Los Angeles. It was still tilting towards the ocean, houses, everything that was left. I could see the big lanes—dozens of big lanes still loaded with cars sliding the same way. Now the ocean was coming in, moving like a huge snake across the land. I wondered how long it was, and I could see the clock, even though I wasn’t there on the Boulevard. It was 4:29. It had been half an hour. I was glad I couldn’t hear the crying anymore. But I could see everything. I could see everything. Then, like looking at a huge map of the world, I could see what was happening on the land and with the people. San Francisco was feeling it, but she was not in any way like Hollywood or Los Angeles. It was moving just like that earthquake movie with Jeanette McDonald and Gable. I could see all those mountains coming together. . . I knew it was going to happen to San Francisco—it was going to turn over—it would turn upside down. It went quickly, because of the twisting, I guess. It seemed much faster than Hollywood, but then I wasn’t exactly there. I was a long way off. I was a long, long way off. I shut my eyes for a long time—I guess ten minutes—and when I opened them I saw Grand Canyon. When I looked at Grand Canyon, that great big gap was closing in, and Boulder Dam was being pushed, from underneath. And then, Nevada, and on up to Reno. Way down south, way down. Baja, California. Mexico too. It looked like some volcano down there (Mexico) was erupting, along with everything else. I saw the map of South America, especially Colombia. Another volcano—eruption—shaking violently. I seemed to be seeing a movie of three months before—before the Hollywood earthquake. Venezuela seemed to be having some kind of volcanic activity. Away off in the distance, I could see Japan, on a fault, too. It was so far off—not easy to see because I was still on Big Bear Mountain, but it started to go into the sea. I couldn’t hear screaming, but I could see the surprised look on their faces. They looked so surprised. Japanese girls are made well, supple, easy, muscles that move well. Pretty, too. But they were all like dolls. It was so far away I could hardly see it. In a minute or two it seemed over. Everybody was gone. There was nobody left. [Brother Branham said: “Japan . . . she’s ready to rock to pieces right now. And there’s no way you can stop it, because they have neglected to do exactly what God told them to do. Instead of preach of Gospel, they have built buildings, and had fine scholarships, and educations” (Uncertain Sound, #61-0415E)]. I didn’t know time now. I couldn’t see a clock. I tried to see the island of Hawaii. I could see huge tidal waves beating against it. The people on the streets were getting wet, and they were scared. But I didn’t see anybody go into the sea. I seemed way around the globe. More flooding. Is the world going to be drenched? Constantinople. Black Sea rising. Suez Canal, for some reason seemed to be drying up. Sicily—she doesn’t hold. I could see a map. Mt. Etna. Mt. Etna is shaking. A lot of area seemed to go, but it seemed to be earlier or later. I wasn’t sure of time, now. England—huge floods—but no tidal waves. Water, water everywhere, but no one was going into the sea. People were frightened and crying. Some places they fell to the streets on their knees and started to pray for the world. I didn’t know the English were emotional. Ireland, Scotland—all kinds of churches were crowded—it seemed night and day. People were carrying candles and everybody was crying for California, Nevada, parts of Colorado—maybe even all of it, even Utah. Everybody was crying—most of them didn’t even know anybody in California, Nevada, Utah, but they were crying as if they were blood kin. Like one family. Like it happened to them. New York was coming into view—she was still there, nothing had happened, yet water level was way up. Here, things were different. People were running in the streets yelling—”end of the world.” Kids ran into restaurants and ate everything in sight. I saw a shoe store with all the shoes gone in about five minutes. 5th Avenue—everybody running. Some radio blasting—bigger—a loud speaker—that in a few minutes, power might be shut off. They must control themselves. Five girls were running like mad toward the YMCA, that place on Lexington or somewhere. But nothing was happening in New York. I saw an old lady with garbage cans filling them with water. Everybody seemed scared to death. Some people looked dazed. The streets seemed filled with loud speakers. It wasn’t daylight. It was night. I saw, like the next day, and everything was topsy turvey. Loud speakers again about fuel tanks broken in areas—shortage of oil. People seemed to be looting markets. I saw a lot of places that seemed safe, and people were not so scared. Especially the rural areas. Here everything was almost as if nothing had happened. People seemed headed to these places, some on foot, some in cars that still had fuel. I heard—or somehow I knew—that somewhere in the Atlantic land had come up. A lot of land. I was getting awfully tired. I wanted to wake up. I wanted to go back to the girl—to know where she was—and those two kids. I found myself back in Hollywood—and it was still 4:29. I wasn’t up on Big Bear at all, I was perched over Hollywood. I was just there. It seemed perfectly natural in my dream. I could hear now. I could hear, someplace, a radio station blasting out—telling people not to panic. They were dying in the streets. There were picture stations with movies—some right in Hollywood—these were carrying on with all the shaking. One fellow in the picture station was a little short guy who should have been scared to death. But he wasn’t. He kept shouting and reading instructions. Something about helicopters or planes would go over—some kind of planes—but I knew they couldn’t. Things were happening in the atmosphere. The waves were rushing up now. Waves. Such waves. Nightmare waves. Then, I saw again. Boulder Dam, going down—pushing together, pushing together breaking apart—no, Grand Canyon was pushing together, and Boulder Dam was breaking apart. It was still daylight. All these radio stations went off at the same time—Boulder Dam had broken. I woke up. It didn’t seem as if I had been dreaming. I have never been so tired. For a minute or two, I thought it had happened. I wondered about two things. I hadn’t seen what happened to Fresno and I hadn’t found out what happened to that girl. I’ve been thinking about it all morning. I’m going home tomorrow. It was just a dream. It was nothing more. Nobody in the future on Hollywood Boulevard is going to be wearing earrings—and those beards. Nothing like that is ever going to happen. That girl was so real to me—that girl with those kids. It won’t ever happen—but if it did, how could I tell her (maybe she isn’t even born yet) to move away from California when she has her twins—and she can’t be on the Boulevard that day. She was so gosh-darned real. I guess I’ll hear that for days. (William Branham, Trying to do God a Service without being in the Will of God, p. 6:25). “O, Capernaum,” said Jesus, “Thou who exalted into heaven will be brought down into hell, for if the mighty works had been done in Sodom and Gomorrah, it’d have been standing till this day.” And Sodom and Gomorrah lays at the bottom of the Dead Sea, and Capernaum’s in the bottom of the sea. Thou city, who claims to be the city of the Angels, who’s exalted yourself into heaven and sent all the dirty filthy things of fashions and things, till even the foreign countries come here to pick up our filth and send it away, with your fine churches and steeples, and so forth the way you do; remember, one day you’ll be laying in the bottom of this sea. You’re great honeycomb under you right now. The wrath of God is belching right beneath you. How much longer He’ll hold this sandbar hanging over that, when that ocean out yonder a mile deep will slide in there plumb back to the Salton Sea. It’ll be worse than the last day of Pompeii. Repent, Los Angeles. Repent the rest of you and turn to God. The hour of His wrath is upon the earth. Flee while there’s time to flee and come into Christ.” Let us pray.” (Choosing a Bride, p. 35:3-5). “Now, the last few days, the great roaring and popping. Then, here come out a paper of science, said, “It’s all honeycombed; it’s got to go under.” They just know it.” “And you watch, the water will come plumb back into the Salton Sea. Los Angeles is doomed for judgment. I tell you before it happened, that you might know when it does happen. I never spoke that by myself. And I’ve never had Him to tell me one thing but what happened. And you can bear record of that. That’s right. When? I don’t know.” “I went out, and they told me what I said. And I listened, went back and searched the Scripture. You know, Jesus said, almost in them same words about Capernaum; and Sodom and Gomorrah was in the bottom of the Dead Sea, I suppose was then. And later, about a hundred years later, Capernaum slid into the sea, and it’s in the sea. The same God that put Sodom in the sea for its sins, the same God that put Capernaum in the sea for its sins, the same God will put Los Angeles in the sea for its sins, that city of corruption.” (Works is Faith Expressed, p. 8:61-64). VISION OF MANY COMING UP OUT OF CALIFORNIA AND COMING GREAT SHAKING IN AMERICA….By Ken Dewey. 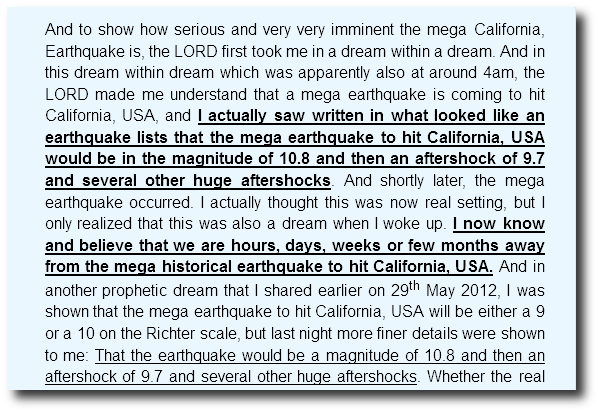 “You must know the Lord has given me many words about coming earthquake in California and other places. Plus he has spoken to me about A TIME OF GREAT TESTING AND TROUBLE coming upon America and the World. ALREADY THESE WORDS HAVE COME TO ME, AND NOT JUST ME BUT OTHER WHO HEAR THE PROPHETIC WORD. He then spoke about the COMING SHAKING which would put many to traveling out of California and other places, in emergency situations. He also said he was moving people BEFORE THE SHAKING TO SPARE THEIR LIVES. Some will remain in California to help, but MANY WILL NEED LEAVE TO BE SAFE. We were renting a large room in downtown Belen at the time of the vision, and there were TWO LARGER ROOMS ON EITHER SIDE FOR RENT… I heard Him say: YOU WILL NEED ALL THREE ROOMS….TO HOLD ALL WHO ARE COMING! I know now that He did not say to rent them all three but that HE WAS TELLING ME TO PREPARE FOR THE MANY COMING.